It’s been a little while since I’ve added a post of my own. I hope you are all enjoying the Skirt Sew Along with our wonderful Stacie! Ok, so today I’m sharing a very brief, 2-part video clip, in which I demo how to transfer embroidery designs from your design CD over to your USB stick. #1 I used my husband’s iPhone to film this, so it’s a skinny screen. #2 In the video, we are transferring all the designs from the cd onto the USB stick – but that is not generally recommended. You see, your USB stick is really not meant to “store” your collections of embroidery designs. If you cram it full of 30 or more designs, your embroidery machine is going to take FOREVER to read your USB stick the next time you plug it in. 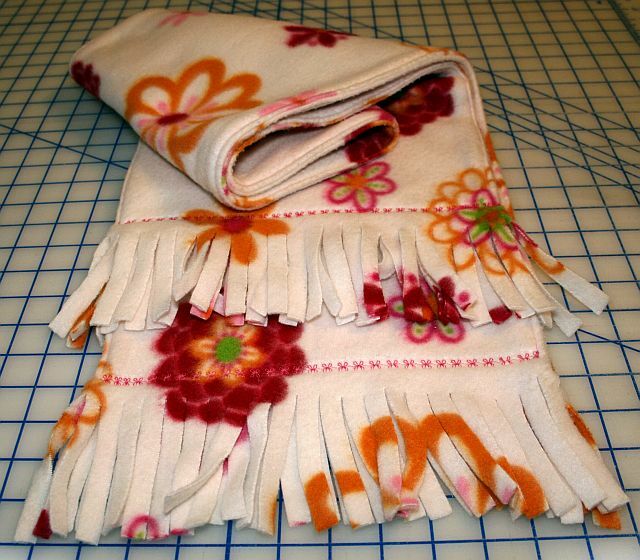 So, instead of bogging down your stick with hundreds of designs that you may not ever stitch out anyway, you may want to only transfer the designs that you are ready to stitch out right now. I’m no computer guru, but I hope this helps! This entry was posted in Machine Embroidery FYI, Tips/Techniques FYI, Video Library, Videos: Machine Embroidery Tutorials & Tips on March 16, 2012 by Jenny Gabriel. 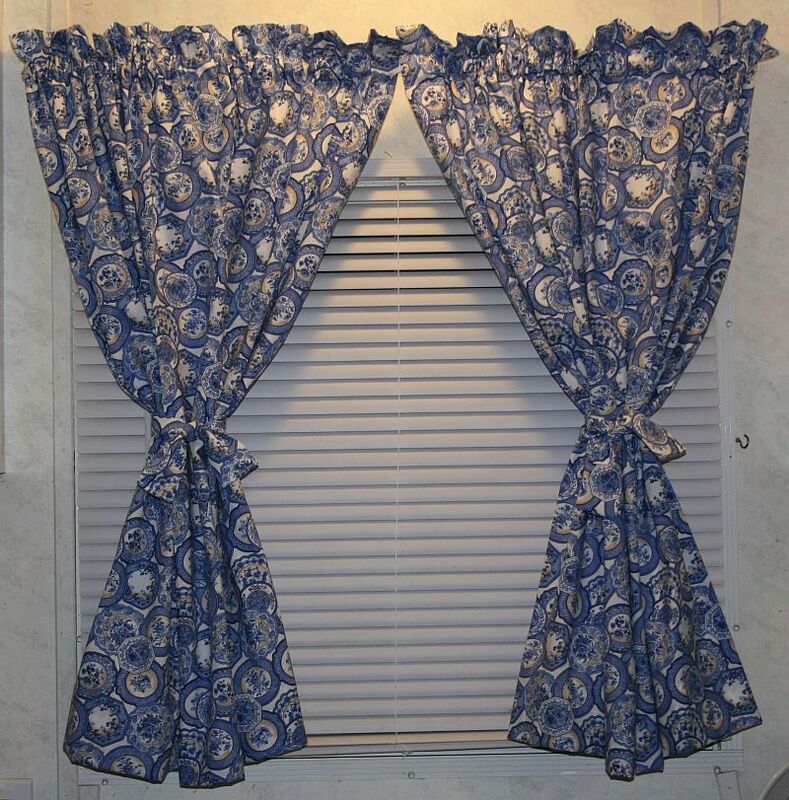 Because I am a sewing instructor, I am frequently asked certain sewing questions. I’ve recently created an illustrated list that I am sharing here. Feel free to share this list with the beginner sewers in your life – it may save them some time when they venture out into one of my favorite places on earth: The Notions Isle! 1. Straight Pins: They come in a variety of lengths and even gauges of thicker, thinner, sharper, etc. My personal favorite, multi-purpose pin type is the flat-heat flower one you see to the left of the quarter. It’s got no-melt technology so if I bump it with my iron, no melting occurs. Yay! And, it’s long and very sharp which really saves time when pinning through multiple layers of fabrics or even when working with delicate fabrics. 2. Pin Cushions: Gotta have a place to keep all those pins! 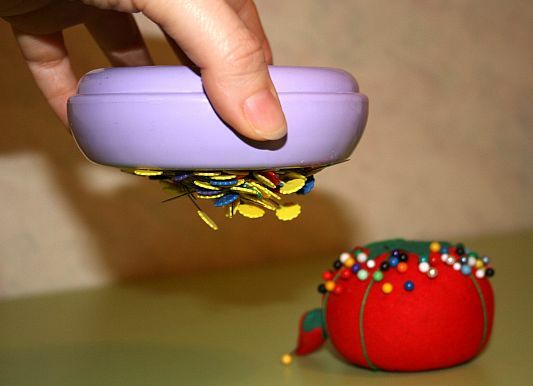 But, I must tell you, not all pin cushions are created equal…. 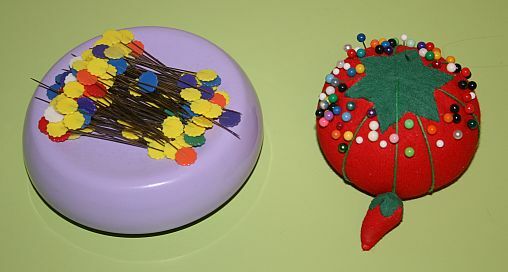 let’s look at the magnetic pin cushion verses the traditional “tomato”. 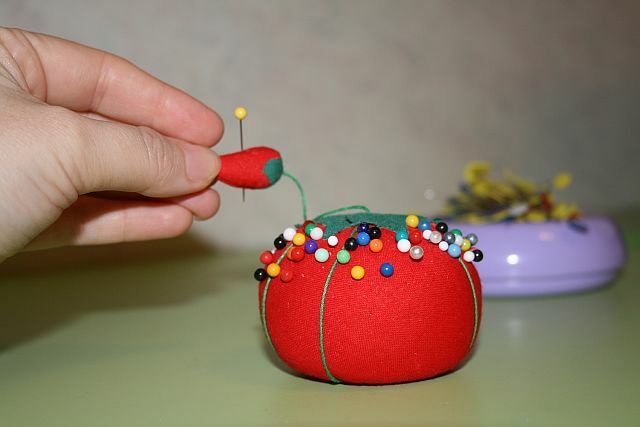 Ever wonder what that little dangling chile pepper you find on tomato pin cushions is for? Well, it’s filled with sand, and it’s for sharpening your dull pins. Just jab your dull pins in and out several times to re-sharpen. That chile is pretty impressive, but wait, I think I hear the magnetic pin cushion talking some smack! "Hey little tomato! Check out my fully awesome magnetic powers!" "Hah! I am on a mission to save feet from pins on the floor!" 3. 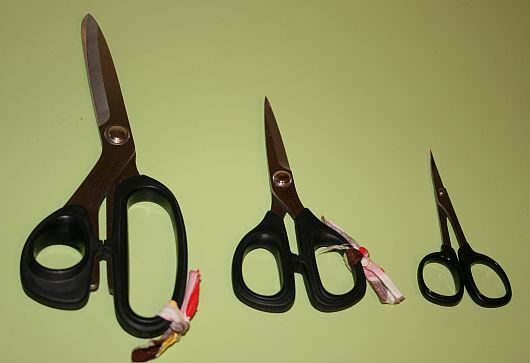 Scissors: Invest in a set of scissors that will be used only for fabric. Using them to cut paper or plastic will cause them to become dull. From left to right: 8″ Dressmaker Shears, a pair of 5″ Scissors for precision cutting, and Curved embroidery scissors (great for cutting threads, and teeny tiny cutting jobs requiring great accuracy). I love these scissors because they are easy on my hands and are noted for their ability to handle multiple layers of fabric. 4. Threads: Most projects will do well with a coordinating poly-cotton blend of thread. As you can see, I use a variety of brands. Coats n Clark all-purpose thread, Mettler, Gutermann, etc. 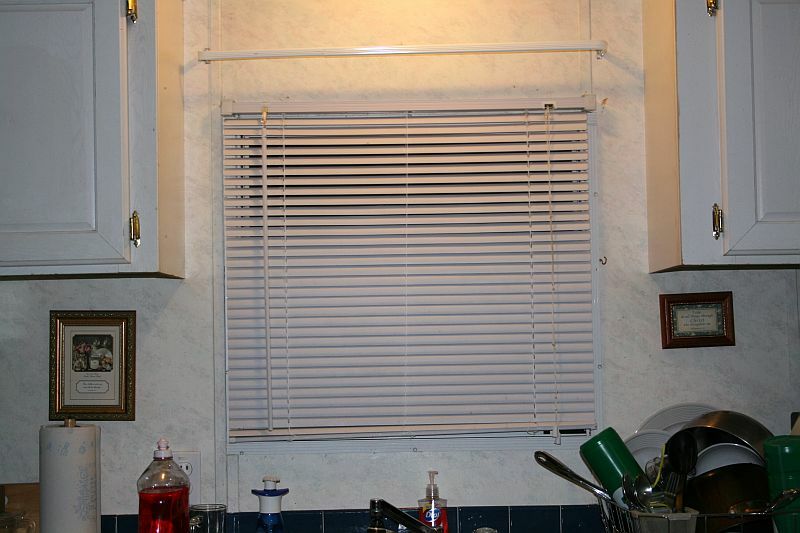 If you inherited someone’s old thread collection, check to make sure it’s still good. If the thread strand seems fuzzy, has lumps, or breaks easily, it should not be used in your machine. Thread on a wooden spool is definitely too old and should not be used either. 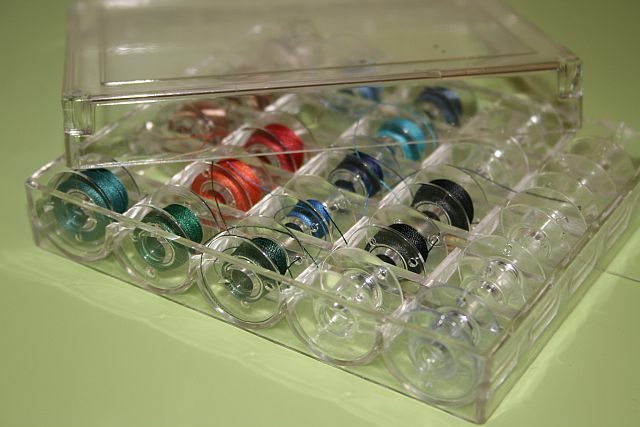 You may want to get some extra bobbins and a little box to keep them organized. Just make sure you get the right sized bobbins for your particular machine. 5. Fabric Marking Tools: Often times, you will need to transfer marks from your pattern to your fabric and it’s important to use something non-permanent that will wash or rub out. Choose from chalk pencils, dress maker’s tracing paper, water soluble markers, air soluble markers, etc. 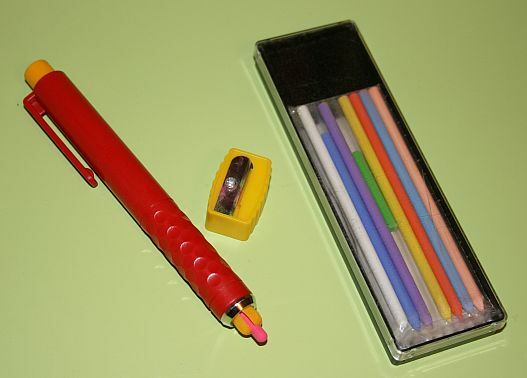 My personal favorite is presently the mechanical chalk pencil that I found in the quilter’s notions at Joann Fabric. I’m also looking forward to buying the new fine line, heat erasable, Frixion pens… Check out the video link below! 6. 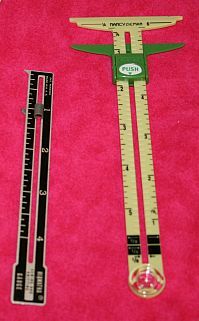 Measuring Tools: You will need a measuring tape and a seam gauge. Trust me, these will come in handy many times as you dig in and get sewing. 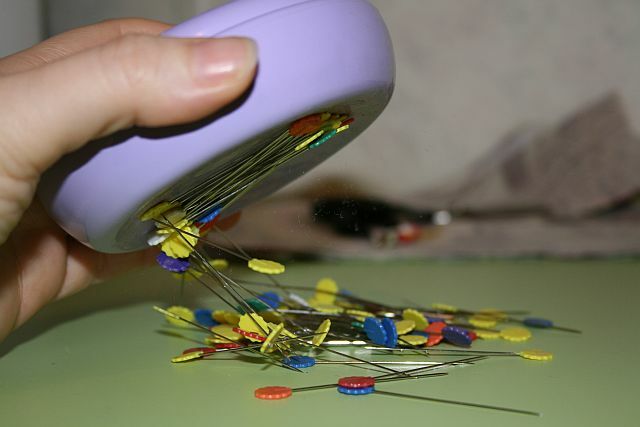 Seam Ripper - Your Friend and mine! 7. 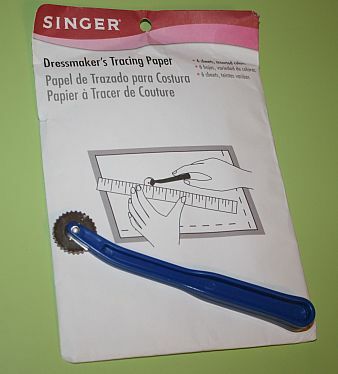 Seam Ripper: Last but not least, in your bare essentials sewing kit, you will need a seam ripper. Think of it as an eraser for thread. If you stitch something in the wrong place etc., this tool is used to cut individual stitches so you can pull them back out of the fabric. 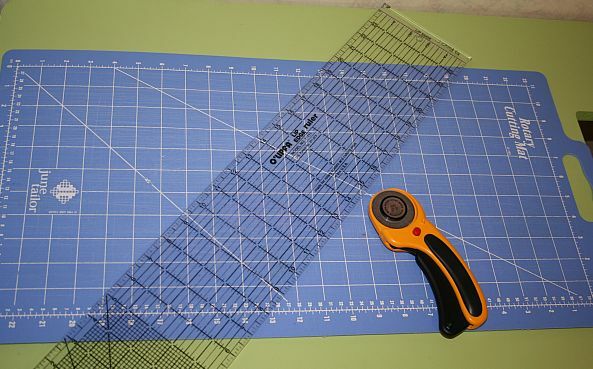 As you sew and try different kinds of projects, your tool box may need to grow. This is because, there are some jobs that are easier done if you have the gadgets and do-dah’s invented to make them a piece of cake! 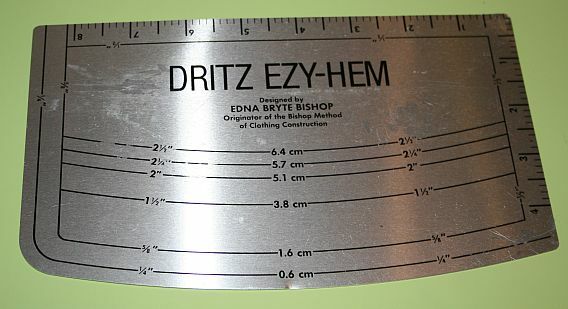 For example, when I’m hemming a large area of fabric, I whip out my handy dandy….. Ezy Hem Guide! And, when I’m making straps or fabic tubes, I love to use my awesome….. Tube Turners! 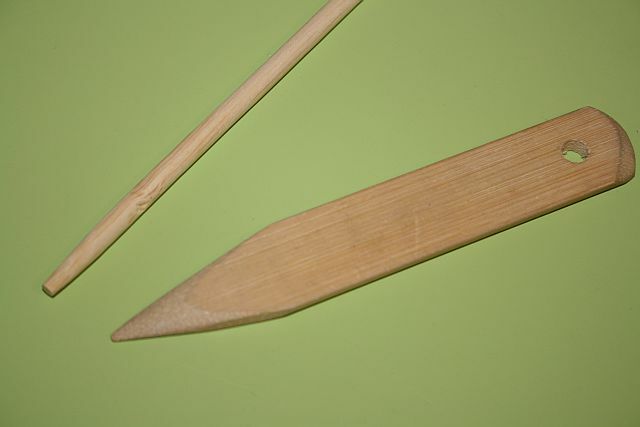 Point Turners can be bamboo, plastic, wood, metal, etc. As long as it's "pointy"! 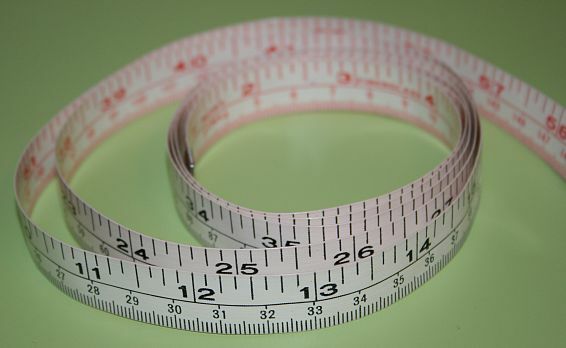 5-in-1 Seam Gauge: In the beginning, you may be quite content with the traditional seam gauge for most of your measuring needs, but later on, you may want to pamper yourself and get the 5-in-1 Seam Gauge. It has many features and functions beyond the norm, but one of my favorite things is that the slider clicks into place and does not shift or slide out of place when using it to measure and mark, etc. 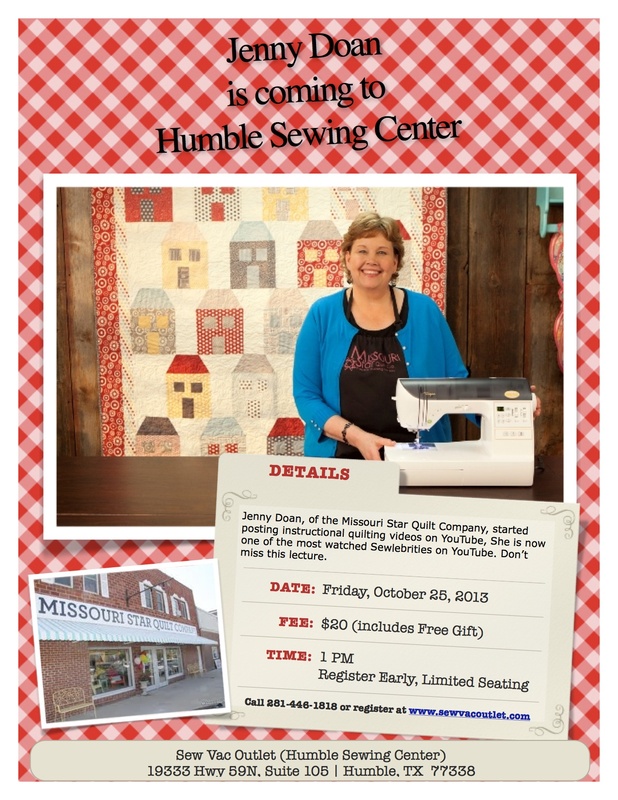 Take a few minutes to watch Nancy Zieman demonstrate this versatile little tool in the video clip below! Thanks for reading! I hope you found this list helpful and that you will share it with your sewing friends. 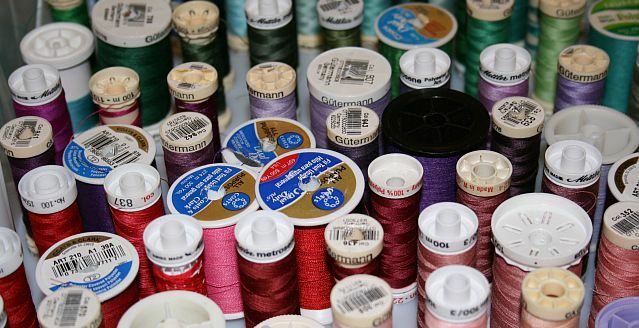 By the way, what are some of your favorite go-to sewing notions? I’d love to know about the tools you’d recommend as well! Have a great week! The New Year is almost here! This entry was posted in Notions Know-How FYI, Tips/Techniques FYI, Video Library, Videos: Notions & Accessories Tips and tagged 5 in 1 seam gauge, ezy hem, sewing notions, sewing supplies, tube turners on December 28, 2011 by Jenny Gabriel.